Gaurav Gera is an actor and comedian who lives for his art, is versatile as clay and charming in his unassuming presence. What napets him apart is that he always strives to break stereotypes with his eclectic choice of work, and is building his own niche in the competitive industry that he is in. Gaurav Gera has verified profiles on Facebook, Twitter and Instagram, having a following of 720 thousand, 50.3 thousand and 324.7 thousand respectively. His huge fan following also includes many Bollywood Actors/Directors/Producers and Social Media Influencers. 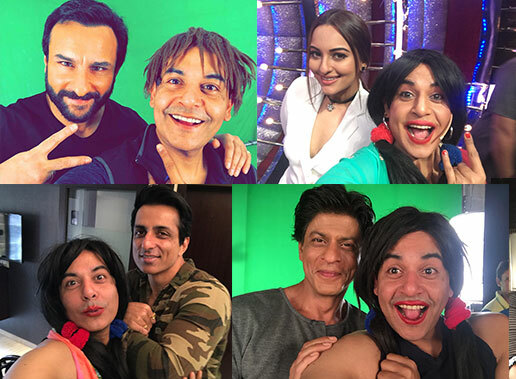 Gaurav’s short Snapchat username, ‘GauravGera’, holds a lot of might as it has already made his loyal fans feel welcome in large numbers. It is addictive to connect to the effortless humor and quirks of his characters. ‘Chutki’ in The Chutki and Shopkeeper series, exemplifies Gaurav’s impeccable skills in mono acting, a fact acknowledged and supported by the many Bollywood stars and television actor friends who make cameos in his videos. The snazzy Billi Masi has already created quite a stir. Gaurav has been granted exclusive Snapchat filters on multiple occasions to meet up with his fans’ demands. His other characters include Chutki’s boyfriend Suyash, Chutki’s brother Chutko and Billi Masi’s hilarious family. Not only this, Gaurav’s surprisingly accurate mimicry of other artists- the latest being Justin Beiber, has left people asking for more! He rose to fame with his big break in the hit Indian television series- ‘Jassi Jaisi Koi Nahi’. Thereafter Gaurav moved across several different roles with successful Bollywood films like Dasvidaniya , Neal n Nikki, Woodstock Villa, Kyu Ho Gaya Na , The Shaukeens, to name a few. Meanwhile, he became a popular face in television, with several shows in his kitty, like the Great Indian Comedy Show, Mrs Pammi Pyarelal, Comedy Nights with Kapil and more. He also performed as the lead actor in the grand musical, ‘Jhumroo’, which was based on the iconic Indian actor and singer- Kishore Kumar. Gaurav has a good grasp of how micro fiction and small webisodes are taking the internet by storm. He is among the wittiest Indian celebrities, who are an integral part of the evolution of entertainment in modern society, providing bite-sized, high-quality laughter via the new world stage that is social media.